Twice a month since 2006 I’ve taught a course for the local safety council on “alternative” transportation to adults with suspended driver’s licenses. The students routinely recognize the benefits of bicycling when prompted: improved health, reduced environmental impact, reduced transportation costs, increased sociability, and of course, simple fun. To varying degrees they also believe cycling to be slow, dangerous, uncomfortable, physically demanding, and impractical if one needs to carry things. So encouraging people to bicycle is more a matter of removing barriers (practical or psychological) than convincing them of the benefits. The psychological barriers to bicycling are often more common than the practical ones, so helping people to see the possibilities is a key strategy. People are influenced and encouraged in different ways and through different channels, including the social realm, finances, urban planning and engineering, and the practical aspects of the bicycle and its accessories. If I had a more scenic place to ride (28%). I believe the most effective thing experienced cyclists could do to encourage others to ride is simply to ride with them in a place and manner that the newcomer would find comfortable. That may initially mean on a trail or quiet local streets. Don’t set any preconditions. Each ride is an opportunity to share your knowledge and expertise. But take care to open up the floodgates of information. Find just a few things to make improvements on each time — get that saddle at the right height; teach proper mounting, starting, stopping and dismounting; get her generally in the right cadence range but don’t fuss about it; etc. — and spend the rest of your ride simply enjoying the trip. Your task is not to make your friend into an expert rider in a day. It’s to show him that cycling can be enjoyable and that there are lots of things he still needs to learn to make it better. If you agree to give the ride a purpose — to go to a restaurant, a park, another friends place — anyplace they’d routinely go by car — that’s even better. I’d really like to see each cycling club start a serious new-rider program. Each weekend there should be rides designed for absolute beginners. This doesn’t mean going 15 mph instead of 20. It means taking the one-on-one approach I outlined above and adapting it to a group. In my 2009 essay Which Cycling Politics: Doom or Possibility? I began with a story. A woman walks into a marketing and public relations firm and sits down to talk with their lead strategist. “Our organization has a fun, safe and healthy activity we wish to promote, but we’re struggling to figure out the right approach,” she says. “What do you mean?” asks the strategist. We must stop being our own worst enemy. While on the one hand we tout the benefits of cycling, too many “advocates” feed the belief that cycling is dangerous. Money can be either a motivator or a hindrance in convincing people to bike, or to bike more. For the person of average means, a bicycle can save money, particularly when replacing auto trips. Illustrating the full costs of auto use can be effective with them. 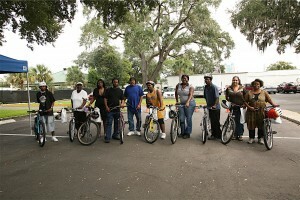 A Get Active Orlando bicycle giveaway for low-income adults. For some lower income persons an auto is essential, and the extra expense of a good quality bike is beyond their means. Further down the economic ladder, many very low income workers use bicycles, but are limited to poor-quality “big box” bikes. Helping lower income people gain access to good quality bicycles while also providing good cycling education could cast “bicycle advocacy” in a much more positive light. At the community level, a bicyclist-friendly business program can help in many ways. Businesses that provide discounts or other bonuses to cyclists make people feel good about the businesses and themselves, and such programs tend to interest local businesses rather than chains. Business owners also come to recognize cyclists as customers, rather than just strangers out on the road. Employers and cyclists can also take advantage of federal tax incentives that that allows bicycle commuting costs to be paid for with pre-tax earnings. A more challenging strategy is removing some of the hidden subsidies for auto use. Parking, for example, is a valuable service that motorists don’t pay for directly in suburban areas (for retail parking all customers pay for parking as the overhead portion of goods and services), and often pay a subsidized less-than-market rate in city centers. Reducing the supply of parking where feasible and getting motorists to pay for parking both out-of-pocket and at its true cost will get people to consider cycling for shorter urban trips (though it really must be done in conjunction with significant improvements to the public transit system). An inverted U rack; the can’t-miss default for quality bicycle parking. Of course, along with reducing subsidies for and dominance of auto parking, communities also need to improve the availability and quality of bicycle parking. 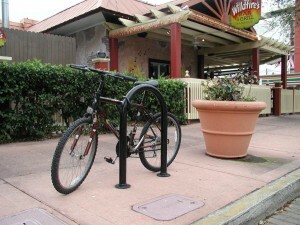 In a 1995 survey of Orlando area residents, respondents identified good bicycle parking as a more important incentive than trails or bike lanes. Forgotten in the discussion of bikeways and increased bicycle use in New York City is the fact that the City also changed its codes in 2009 to require commercial buildings to accommodate bicycle driving employees. Bicycle theft has long been a serious deterrent to cycling in New York. Leaving a bike locked along the street – even with the best of locks – has always been a risky proposition for cyclists there. It’s quite possible the bike parking code did more to encourage cycling than the bikeways did. Local governments should require quality short-term parking for customers and more secure long-term parking for employees. 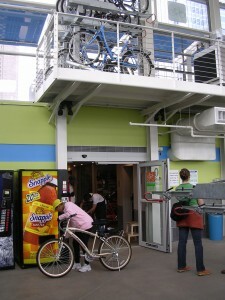 It’s also imperative that permit review staff understand the particular needs and criteria for quality bicycle parking. There are myriad ways to do it wrong, and relatively few ways to do it right. Many Americans live in far-flung suburbs, in which important destinations are beyond comfortable cycling distance. Combining bicycling with transit can overcome this challenge. To do so, planners need to provide good connections to and good bicycle parking at transit stops, bicycle accommodations on buses and trains, and other useful amenities, such as bike-sharing systems and shower and locker facilities. A short path connecting cul de sacs in California. Trails, bike lanes and other types of separated facilities are often pitched as encouragement as much as they are for safety or mobility. I will leave discussion of the validity of such claims for the Engineering section of this site, but there are engineering treatments that can serve as productive encouragement without compromising the principles of integrated bicycle driving. Trails in their own rights-of-way and short connector paths can help cyclists stay on neighborhood street networks and avoid busier arterial and collector roads. Shared lane markings (“sharrows”) and “Bicyclists May Use Full Lane” signs can make it clear to cyclists and motorists alike that bicyclists are normal and expected users of the roadway, and that a centered lane position is usually the preferred position. Ensuring traffic signal detection systems detect bicycles not only improves safety, but demonstrates that a community cares about the details. Many non-cyclists and inexperienced ones make assumptions about the practical aspects of cycling: that bicycles are inherently uncomfortable; that one can’t carry very much; that bike thieves can’t be foiled; that bicycling requires a high level of athleticism. No doubt many who hold such opinions are simply expressing rationalizations to excuse themselves from having to consider cycling at all. Those people are probably not the “low-hanging fruit” of potential new cyclists. 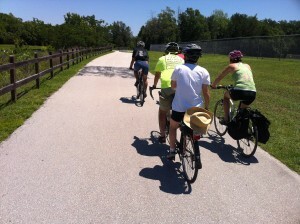 CommuteOrlando and Bike-Walk Central Florida “S-Cargo” ride. But others simply haven’t been exposed to the practical solutions to those challenges. On the personal level, we can offer to check that our friends’ bikes fit well and have appropriate saddles. Advocates for cycling can work with their local shops to encourage them to carry accessories like panniers and trailers if they don’t already. Cargo bikes could be an element of a bike-sharing system. 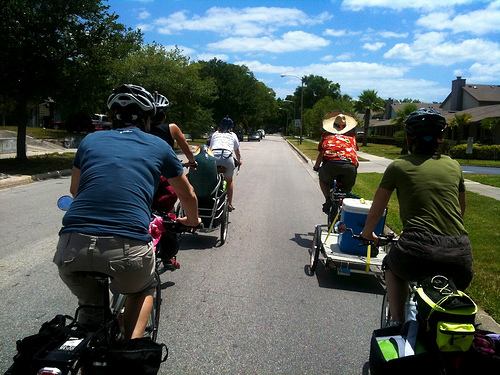 CommuteOrlando and Bike-Walk Central Florida lead “S-Cargo” rides, in which the group rides to a local farmers’ market with cargo bikes, trailers and panniers. Those without such accessories also ride along and get to see the practicality of these tools first hand, as do many of the market or store customers and employees. It should be clear that there is no single silver bullet for encouraging people to bike. Some of these strategies can be advanced by us as individuals; others require organization and sustained effort. Communities that take such an all-of-the-above approach are likely to see real progress. great advice, especially on how to deal with beginners! keep it up! you have great content! Great points! Im a mom who lives in the city and want my kids to ride to school. In fact We should have more bike lanes everywhere so we can segregate the high speed traffic from the low speed and make it safe to ride on all streets. Hannah: If you read more of this site you’ll find that we do not support bike lanes in most circumstances because they do not make cycling safer. Indeed, they lead untrained cyclists into conflicts they do not understand. Speed segregation or mode segregation are not what provides safety. Predictability and conspicuity do. Providing safer routes for kids means connecting local streets so kids can stay off the major arterials. Oh goodness! You must not live in a dense city like our family. There are no real local street connections to get places most of the streets are major ones with people driving crazy. We need protection and space to ride safely. Everything here is car dominated. Sorry i thought your org was looking to help. I’ll check other orgs. Sorry. Hannah,we most certainly do want to help; but with real solutions, not make-believe ones. Have you guys ridden in Sweden or Denmark? Really amazing and safe streets out there according to statistics. 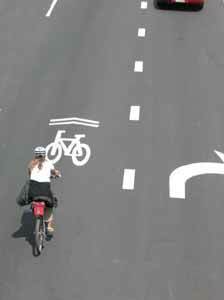 The cars have been nearly completely segregated from bicycle traffic and are engineered to prevent speeding. I want that here in my city so my kids can ride safe and free like they do in cities over there. Suggestion: NOT to open up the floodgates? Hannah, Mighk is correct, and whether you agree with his observations and recommendations or not, you still need to get involved in your community in order to make your desires known. Even in our community, with some bike advocacy and pretty supportive political officeholders, it is a time consuming effort in order to make sure all parties know what the end users want to see happen on the street. It is worth the effort, however long you can participate and however much you can share. Please do it. If we haven’t driven Hannah away completely, I’d be interested to know what dense city Hannah lives in. I don’t live in a dense city so I may have a hard time visualizing Hannah’s concerns. 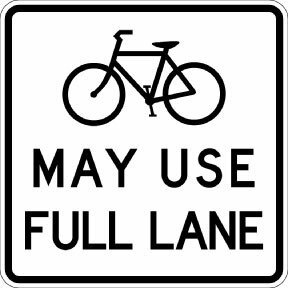 Where can I get a thousand bumper stickers that say Bikes May Use Full Lane? They belong on cars more than on bikes. The origin and influence of our stories. Understanding negative stories and how they are held in place by cultural norms. Unleashing the power of positive stories. The barriers to bicycling are perceived more-so than real, so helping people to see the possibilities is a key strategy. People are influenced and encouraged in different ways and through different channels, including the social realm, economics, urban planning and engineering, and the practical aspects of the bicycle itself and its accessories.